After several months of working on this short film we’re delighted to be able to share it with you. The idea behind this film is to show the story behind our broth, from bone to mouth, and the hands that make it. We hope you enjoy it, that it stirs up your appetite and that you come in and taste it for yourself. Happy new year all! Sunday 21st of this month we'll be hosting a watercolor popup with local DC-based food illustrator Marcella Kriebel. Participants will learn basic water color techniques while munching on some delicious, healthy Japanese fare prepared especially for the event by Toki. Tickets are limited, so please get in early. Link here for more info. Sup' Ramen lovers! We recently added this winter squash dish to our menu. It's easy to prepare, looks great and is full of umami. We serve it in the shell because its fun to eat and looks dope, but iut can be served as a mash just as well. We use butternut squash but Honey nut will also do. The Hijiki and and Miso are available at most Asian grocers. For those living in the District, check out Hana grocer or any of the K-mart's on the outskirts of the city. Pre-heat your oven to 400 Degrees F. Slice each squash in half and spoon out the seeds. Drizzle with some olive oil and season with salt and pepper and bake for 40 minutes. The flesh should be soft and tender. While the squash bakes, prepare the butter. Place the hijiki in twice the volume of warm water and let sit for five minutes, then drain. Using a whisk, mix the melted butter, garlic, hijiki and aka miso together in a bowl and set aside (the butter will keep for three days refrigerated). Remove the squash from the oven and fill the well with your butter. Garnish with microgreens and serve. Hola Toki homies! Sunday October 1st we'll be hosting a popup at Toki in collaboration with Chaia, the awesome vegetarian taco shop in Georgetown. 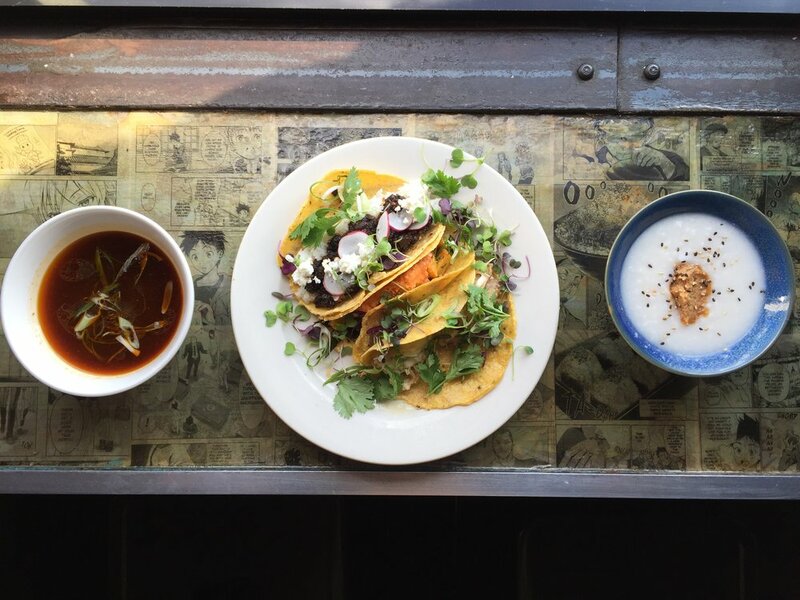 We'll be offering a vegetarian taco trio mashup of the best that Toki/Chaia has to offer including a fermented black bean, queso fresco and rice taco; sweet potato, kale and kimchi creme fraiche taco and fried enoki with tarragon and ginger-lime yoghurt taco. $3.75 each or the trio for $11. 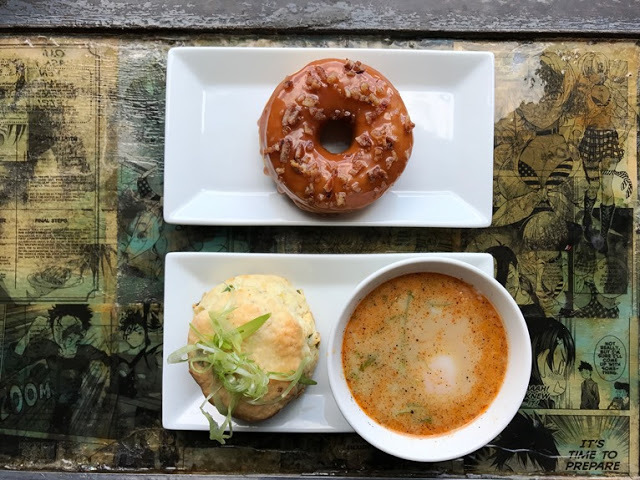 We'll also be have a celery root slaw, root vegetable broth and coconut arroz con leche with date caramel as well as bangin' house cocktails. Walk in only. Doors open 11.30-2.30. Limited seating, take out available! Call us at 202.388.3086 or check out our insta for more info. On Sunday, September 10th, Toki will partner with Lily Cox from The Lemon Collective to host a Kokedama workshop and sake tasting. Guests will learn how to make Kokedama (aka a hanging Japanese garden) at this one-day-only collaboration pop-up at the H Street ramen shop. The restaurant, which is normally closed on Sundays, will open for the pop-up from 2:00 p.m. to 4:00 p.m. Tickets are $75 each and include all supplies needed for each participant to make their very own hanging Japanese garden, complete with care cards. Lily will talk about the history of Japanese hanging gardens and show participants how to assemble their own. We'll also be doing a sake tasting paired with East Asian inspired nibbles. The regular Toki menu offerings will not be available during this time. Tickets are available at: https://fareharbor.com/astrangeflowerdc/items/59402/. Love Toki? We just printed off a batch of fresh Toki Tees, modeled by the one and only Brandii. Sizes S-XL available in limited quantities. Only available in store, $20 each. Spread the Toki love!